Happy Monday lovelies! Hope your February is coming along well. I have had a month full of activity so far, and am hoping this week will be full of happy excitement as well. For this week’s Inspired Mondays post, I wanted to keep things simple and talk about a concept which might seem easy but has very powerful implications. I am talking about the ‘law of attraction’. If you have read the book ‘The Secret‘ or explored Mike Dooley’s blog ‘Thoughts become Things‘, you will know what I am talking about. What we think, we become – Our life is a physical manifestation of what goes on in our heads. The universe responds to our thoughts, so if you think it, you will have it – like a magnet! We attract what we put out there – Life is an echo; what we send, we receive, what we sow, we reap and what we give, we get. Our thoughts are powerful magnets, so the universe manifests more of what we focus on. If we are grateful, we get more reasons to express our gratitude. If we are happy, we find more happiness! So reflect what you desire and attract what you expect. Change your thoughts and you will change your world – Energy follows intention, so the more you think abundance, the more abundant you will be. Think positive and always express gratitude, remove negativity and stop complaining. Think good, and good will manifest. Be mindful of self talk – Tell the universe what you want instead of what you don’t want. Instead of saying ‘I don’t want to gain weight’ say ‘I want to be slim’. Even better, speak as though it has already happened and say ‘I feel thin and light’. Bottom line – think, believe and do as you want to feel. Change the way you think, and see how it changes your world! Ask (Intent) – Set clear intentions (goals). Make it physical – write it down, or create a vision board. Spend time every morning and evening thinking about these goals. 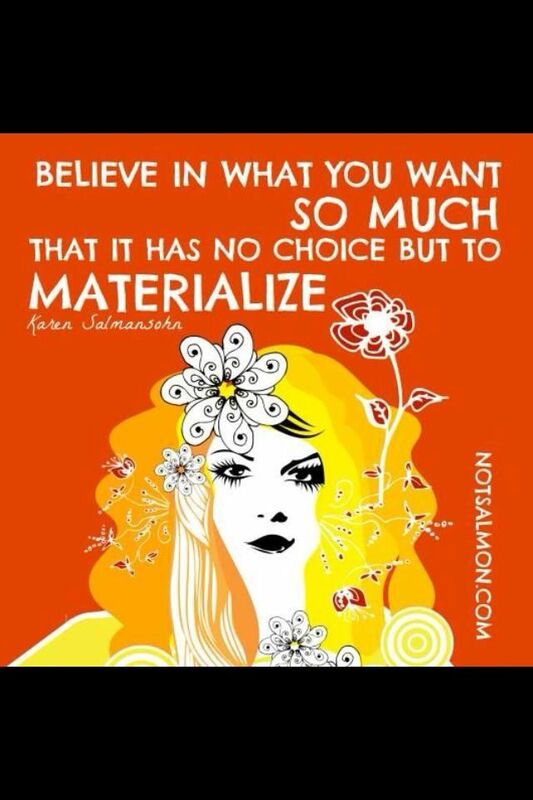 Believe – Believe in your intentions and expect them to manifest. Visualize yourself having it already, be open to receiving what you want. Feed your intentions with positive thoughts and affirmations everyday. This is important – make sure to clear your mind of any doubt or negativity and focus on the end result. Action – Once you have strong intentions and stronger belief in achieving them, complement these positive thoughts with positive actions. Take inspired action and work towards your goals with passion, determination and trust. Don’t forget to keep your focus on the end result and visualize your success. Receive – Be excited, thankful and keep expressing your gratitude and happiness. The more you are thankful, the more things you will attract to be thankful for! So there it is – the law of attraction and how you can use it to manifest what you want in life. Whether it is love, money, success, fame or happiness, this is a powerful tool to get what you desire. Even if you haven’t warmed up to the idea stated above, think about it on these lines – all it is asking you to do is to change your thinking and attitude and become more positive and grateful in life. Now how can that backfire in any way? Have you used the law of attraction and found success in manifesting your desires? Do share your experiences via comments below. Have an inspired week! Sometimes we receive people, places, and things that we do not think about. Opposite of The Law of Attraction. True! Still, I feel that we should continue being positive and think about what we want rather than what we don’t as it helps lead a happier life. I’ve read about this many times and never tried it, however simple it is to do. Perhaps reading this is a message, the time to start is now! Thanks so much for linking to my post on this topic. I will backlink to shoot people over here as well, and pin it to my Blogs and Bloggers Pinterest board – good post! I’ll also be back to see what ELSE you’ve written on your blog – as quickly as time permits.